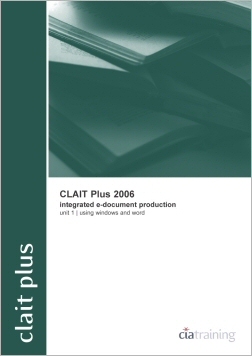 The 1st guide in the CLAIT Plus 2006 series will give you an understanding of files and folders, including file protection. You will be able to use a word processor to enter and amend data, as well as to perform mail merge. You will learn how to work with tables and to import and manipulate various objects. The guide will teach you the skills needed to apply a specified house style to documents and to check your work for accuracy. Endorsed by OCR. This product is available in 6 different versions. Click the Buy Now button at the top or bottom of the page to select the version you would like to add to your shopping cart. All CiA Training resources are available in individual printed book format or as digital site licences in Microsoft Word or PDF format. Site licences are only suitable for organisations and allow unlimited editing, customisation, printing and VLE uploads. Please refer to our Purchasing Options page if you have any queries regarding our ordering process. Click the Buy Now button at the top or bottom of the page to purchase this title. For help, please Contact Us.